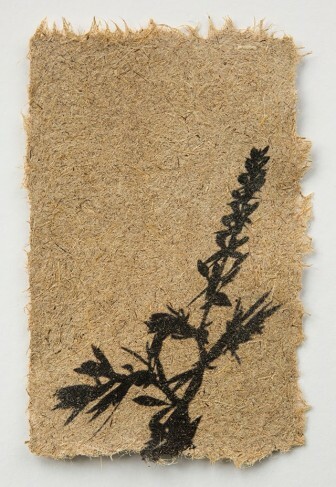 LANSING — An East Lansing artist prints the shadows of endangered plants on handmade paper crafted from the invasive plants that threaten them. A shadow of cream wild indigo printed on paper made from invasive phragmites. Credit: Jane Kramer. The others chosen for the Japanese exchange were woodblock print artist Linda Beeman of Owosso, fiber artist Martha Liddle-Lamenti of Owosso and pastels artist Thomas Tomasek of Ovid. In her work, Kramer transfers the shadows of endangered and threatened plants onto paper constructed from invasive plant pulp. Making the paper isn’t an easy task and is especially hard on her blender. The process is intensive. 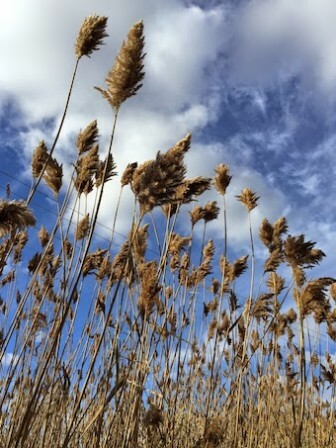 Kramer makes pulp from invasive plants, like phragmites stalks, garlic mustard, common buckthorn, reed canary grass and others. She boils the plants down, mixes them with soda ash and then blends the solution two to three times. Kramer borrows an industrial-sized colander from the Out of Hand Papermaking Studio in Ann Arbor to strain the paper before drying it. Many of the photographed species are endangered because of invasive plants. But Kramer finds that private property owners, such as plant enthusiasts, have the best gardens to photograph. They generally have multiple plants of one variety, and Kramer can manipulate the plants. Finding them is a challenge because many gardeners keep their plants secret in fear of poaching, she said. When she captures a perfect image, Kramer transfers the shadows onto her hand-made paper using transparency film. “I like that it’s all natural,” Kramer says. The only chemicals used are soda ash and hand sanitizer during the shadow transfer. Kramer said she hopes her 30 prints will engage and educate community residents. The project will be shown at the Lansing Art Gallery from Jan. 8 to Feb. 26. She is partnering with the Michigan Nature Association to provide educational pamphlets about planting native plants, properly disposing of invasive plants and conservation in general. Kayla Smith writes for Great Lakes Echo. LANSING – A vast majority of state residents have access to high-speed Internet, a tool which the global marketplace increasingly relies on, according to the Telecommunication Association of Michigan. Even so, pockets of the state still struggle with slow broadband speeds.